We just completed our 4th expedition to Guadalupe this year and the sharks have been amazing. Unlike in previous years, we are seeing more juvenile females than males this season. There have been over 10 new sharks already and every trip we encounter more new "friends". On each expedition, we encountered over 18 different sharks, swimming along with seals, turtles and dolphins. As for the regulars, they have been slow to show their faces. So far we have seen "Joker" and "Chugey", who looks amazing by the way. His injuries from a few years ago show fewer and fewer remaining scars. On our last day of our most recent expedition, Bite Face, another long time regular at Guadalupe Island made an appearance for the first time, but most of the sharks we've seen so far have been more recent additions to our database. Amiria, Freya, Screaming Mimi, Andy, #198 and Micks are among those encountered so far. Tonight we are heading back to Guadalupe where I hope we'll encounter more of our old friends. This is my 16th season diving with these sharks and I'm more excited to head down there than I was on my first expedition. 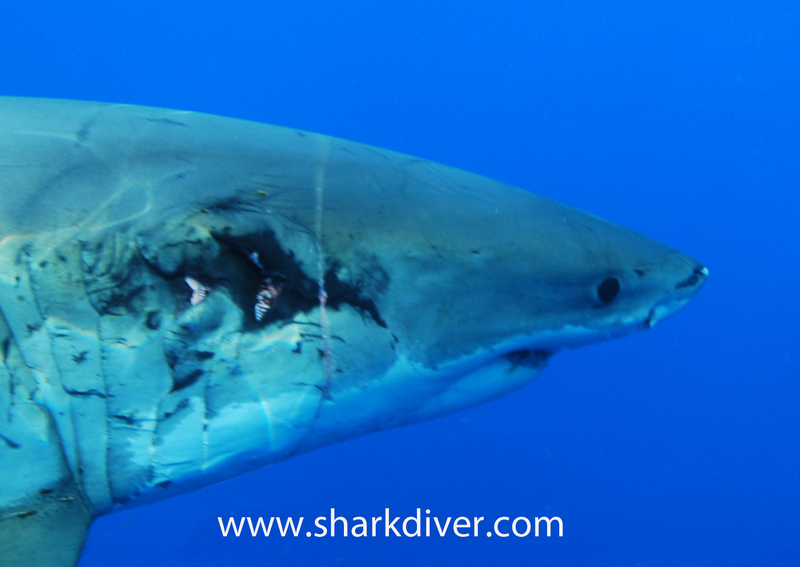 I hope to get to introduce you to the amazing great white sharks at Guadalupe Island soon!